You have a beautiful entrance porch and hallway and so our aim is to maximise your enjoyment of this space. Starting with your entry porch, we are suggesting tiling for the floor in terracotta, blush tones. These tone repeat in the lounge and so helping to create flow. They are also a nod to Mallorca, one of your favourite places for style. Clearing the coats and shoes out of this space allows you to create a more welcoming space with pots and plants. Moving into the main hallway, we are suggesting built in storage for coats and shoes and seating with cushioning. The addition of a sofa truly converts your hall into another living space. 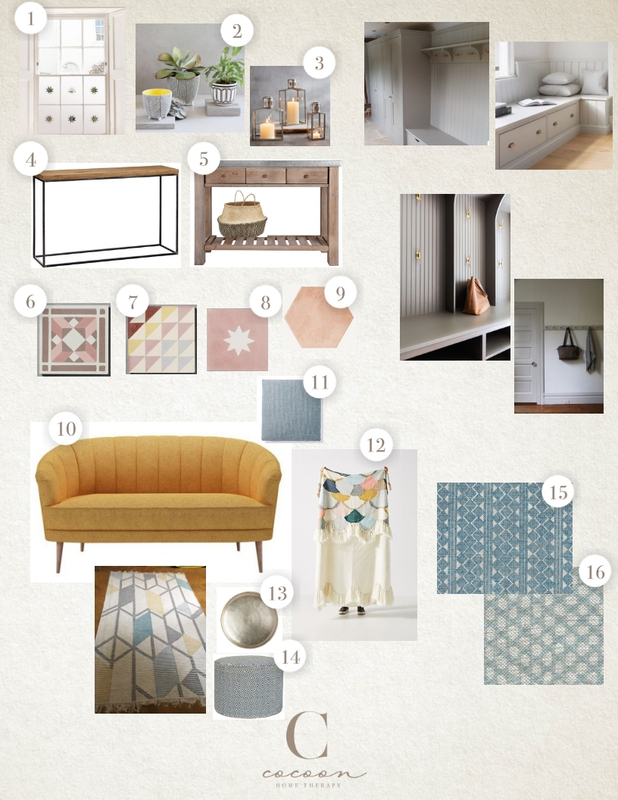 The colour palette is inspired by your lovely rug.